E-commerce payment services company, PayFort released this year’s State of Payments report, highlighting all that you need to know about the region’s electronic commerce sales and trends. The report focused on the UAE, Saudi Arabia, Egypt, Lebanon, Jordan, and Kuwait, giving a balanced analysis on six popular but very different markets. The 2015 State of Payments report focused its regional analysis on five markets, including e-commerce, airlines, and tourism. It also looked at consumer trends, including payment methods and social media popularity. Whether you’re trying to maximize online sales or whether you want to make sure your e-commerce (or m-commerce) payment solution will be a regional hit or not, these are some of the major takeaways from the report that shouldn’t be ignored. Unless you’re in the entertainment and events industry, SEO still plays a pivotal role in increasing online sales and improving brand visibility. In the region’s airline market, SEO is given top priority, alongside social media, email marketing, and offline marketing channels, making it more important than content marketing. It’s a similar case with the e-commerce industry, where SEO and social media are the two top marketing channels. In the growing industry of marketplace services, SEO is the most important marketing channel at 26%. While offline channels, referrals, and social media are considered important (each at 13%), they aren’t considered anywhere near as resourceful. In the travels and tourism market, SEO is second to user reviews, but only by 2%, and understandably so. However, SEO isn’t considered an online sales booster at all in the entertainment and events industry. The report shows that this industry heavily priorities paid searches at 44%. Of all the different markets in the region covered, the one that is expected to grow the most is the e-commerce market. While its current market size is already rather large, given the obstacles to change consumer trends when it comes to online payment, its market size is expected to grow by US$6.4 billion by 2020. This means that the e-commerce industry in the MENA will be valued at about $13.4 billion, almost twice as large as it was in 2014 when it was at $7 billion. Of the countries studied, the UAE’s industry has the largest market share in the region at $2.3 billion, and is expected to grow to $4.4 billion by 2020. Saudi Arabia and Egypt are both rather large as well, currently at around $1.5 and $1.4 billion respectively, and are each expected to grow up to $2.9 and $2.7 billion by 2020. The other studied markets are certainly growing as well, just not as substantially. The region’s airlines market size is projected to grow from US$11 billion in 2014 to $16.2 billion. While it comes to no surprise to see the UAE and Saudi Arabia’s already large market shares grow, it appears that Egypt is also heavily investing in its airlines industry, with a projected growth from US$1.9 billion in 2014 to $2.8 billion in 2020. While Lebanon and Kuwait are both expected to grow by $0.2 billion by 2020, Jordan isn’t expected to experience any substantial growth. Perhaps this isn’t much of a shocker, but it’s still worth mentioning. 26-35 year-olds are the largest online buyers in the region in all countries, and by a huge amount. Apart from Lebanon, where 26-35 year-olds make up 34% of online buyers, the UAE, Saudi Arabia, Egypt, Kuwait, and Jordan’s 26-35 year-olds make up at least 42% percent of online buyers. 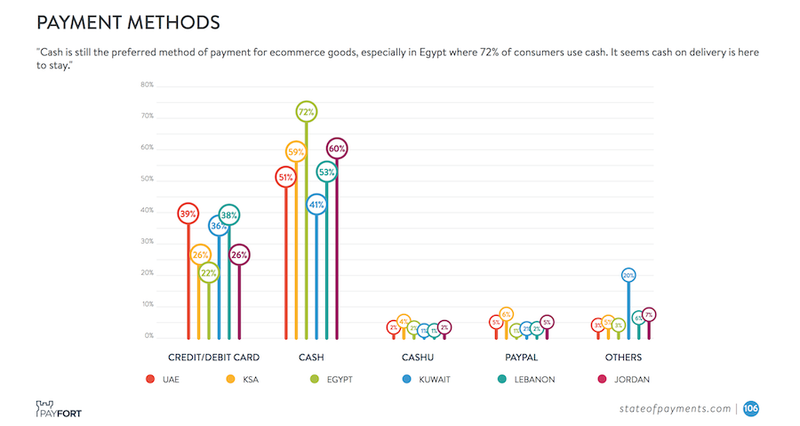 In Egypt, they make up 50% of all online buyers. While it makes sense to see those between the ages of 36-40 and 41-50 years settle somewhere between 15-20%, it is probably most startling to see 18-25 year-olds not exceed the 18% mark. Apart from Saudi Arabia, where 18-25 year-olds make up 25% of online buyers, other countries have much smaller amounts, most surprisingly the UAE at only 10%. While it is surprising to the see the UAE, the country in the region with the largest e-commerce market have a smaller percentage of young adults buying online than the other surveyed countries except for Kuwait, it is expected to see these numbers grow across the region as the online payment solutions develop further and consumer trends evolve. Of the six countries surveyed, Facebook and Twitter are still the two most important social media platforms. However, it looks like things could change a bit in the coming years, so entrepreneurs should take note of this if they want to maximize their online sales. Facebook is a must; apart from Saudi Arabia where its popularity is at 67%, its popularity in the other five countries exceeds 80%, and goes past 90% in Lebanon and Egypt. Twitter is still quite popular in the region, but falls far behind Facebook, and has several social media platforms almost equally as popular. LinkedIn, for example, is huge in Lebanon and is more popular than Twitter and Instagram by 6%. It also exceeds Twitter in the UAE, and only falls behind by a few percentage points in other markets, except for Saudi Arabia where it doesn’t seem to be a huge hit. Presence on Google+ is important too, given that its popularity across those six country ranges between 30-38%. One thing is for sure though, Instagram keeps on getting more and more popular. While the results only show its rising popularity in certain markets, it’s just a matter of time before it makes its way out of a deadlock with LinkedIn, Google+, and even Twitter in some of the other ones. Perhaps it’s almost sinister to save this fact to the end, with all the relatively positive news about online purchases and the e-commerce industry happening in the region. It’s important to remember that the dreaded Cash on Delivery (COD) method still dominates payment methods for online purchases. PayPal? Forget about it. Only 1-6% of consumers use it as a payment method. Oddly enough, Lebanon’s at about 2% even though PayPal isn’t compatible with Lebanon yet, if ever. Paying directly with a credit card isn’t that popular either. It’s currently the most popular in the UAE at just 39%. Lebanon and Kuwait are right behind it at 38% and 36% respectively. CashU is also mentioned, which is a popular prepaid online and mobile payment method; but its popularity doesn’t exceed 4%. There are also “other” payment methods, but those percentages are small, bar Kuwait’s, which is at 20%. The elephant in the room is still COD, and it makes the other payment methods look like rodents. It’s the least popular in Kuwait with only 41% popularity, but is the most popular among over half of UAE online buyers at 51%. Saudi Arabia’s COD popularity is at 59%. COD has found a cozy home in Egypt, with its popularity at 72%. That said, that is not a surprise, given that credit card ownership is very low there. It looks like the most successful e-commerce payment solution will be the ones that target consumers who don’t own a credit card. Time to be creative.